Keeping in view the importance of changing store's credentials according to user's Geo location in today's multi store's E-commerce businesses, FME has come with a unique and highly useful Magento 2 extension called Magento 2 currency and language switcher. 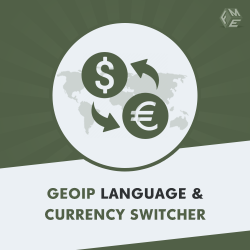 Magento 2 currency switcher allows you to change the language and currency of the store according to user's location. This extension by FME automatically identifies visitor's location from their IP's and changes the store's credentials accordingly. This feature brings two major benefits. First, it provides customers a localized shopping experience as they see the store in local language and shop in local currency. Second, it drives targeted traffic. Magento 2 currency switcher offers manual switching also. It helps visitors who want to stay on the same store. They can manually select the store from the dropdown menu displayed in footer.